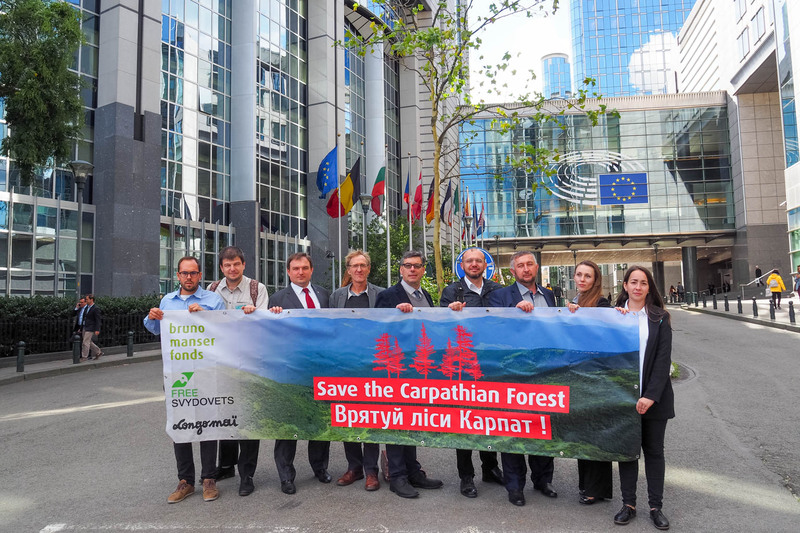 Supporters of the Wilderness preservation in the Ukraine–initiative group Free Svydovets recently informed the Europarliment in Brussels of the importance of the unique Ukrainian Svydovets massif. A month ago, European Wilderness Society visited Svydovets observed with our own eyes the value of this last significant Carpathian Wilderness. The landscape is beautiful, fragile and already influenced by human activity. We should work together to protect the Svydovets massif and the economy of the local community so that future generations can also experience this unique area. The message that the area is the subject of a proposed mega-ski resort, offering recreation for more than 22 000 visitors per day, has now been passed to the European Parliament. Around 60 hotels, 120 restaurants and 33 ski lifts, planned for 230 km of slopes, will destroy the biodiversity of Svydovets. About 6 000 litres of waste water will flow into the river Tysa. The river disembogues through five European countries. We already have a statement from the government of Hungary, which demands inclusion of the European scientists to the group which will conduct an Environment Impact Assessment of the Ski-Resort Project. -Tymur Bedernichek, ecologist and member of the Free Svydovets intiative group. Hungary and Ukraine are two of the seven Carpathian countries who ratified the Framework Convention on the Protection and Sustainable Development of the Carpathians (Carpathian Convention). Therefore, the preservation of the Svydovets massif is not only relevant to Ukraine but is also an international task. The area is already suffering from climate change impacts (floods, intensive precipitation, droughts, etc.) and building a huge ski resort and accompanying infrastructure will further influence the frequency and strength of these disasters. Of course the economic situation of the region should also be considered, as the local population is currently experience high unemployment rates. However the ski resort will not solve the problem of unemployment, and the majority of profits will go to a few investors rather than the local community. Instead, small family businesses and local traditional economy, including green tourism should be supported. Since 2017, there have been many European ecological organizations interested in the issue of Svydovets. We sent out more than 5 000 letters to the official institutions of Ukraine, but mostly without answer. This summer we visited Svydovets with the group of European scientists and observed the uniqueness of this massif, but also observed the hard economic situation of that region. Therefore we proposed to develop tourism with low impacts on nature.